Eons ago, when I was still in my teens, a friend and I walked out of the Fulton County Stadium on a sweltering Atlanta night and came face to face with a “begger”. Up to that moment, we had been goofing around: laughing, singing, having fun watching the Braves lose another one. The frivolity of the evening ended when I encountered homelessness for the first time. Prior to that summer night, I had been naive enough to believe everyone went home to a warm dinner and a comfy bed. And then this man approached us, “Excuse me, can you spare some change? I’m homeless. I’m hungry.” The look of him…the painful pleading in his expression, the desperation in his quivering voice, his dirty, wrinkled clothing…stopped me in my tracks. I wanted to make his life better but felt helpless to do so. A lump lodged in my throat as I reached for the fifty cents in my pocket, “This is all I have, I’m sorry”, I said. “Thank you, ma’am. Bless you,” he said. My friend grabbed my arm and pulled me away. “Why did you do that? Why did you give him your money? I can’t believe you fell for his trick. He’s just here to get people to feel sorry for him. He has the same opportunity everyone else has, all he has to do is get out and get a job but he doesn’t want to work. It’s easier for him to beg than it is for him to go to a job every day”. On the drive home, my friend and I had a heated discussion about poverty and opportunity. We didn’t see eye to eye on the subjects. Later than night, cool, dry and tucked safely beneath my covers, I cried for the man we had encountered outside the stadium. I couldn’t get his face out of my mind. His skin had the ashen look of poor nutrition, his eyes were hollow from hunger. I knew he didn’t live that way by choice. No one does. I’m ashamed to say, I haven’t done much to help the homeless over the years. Donations and food drives have been the extent of my giving and service. But I know someone who has done so much more. Vitelle Webb’s life and work is an inspiration to all who know her. She has written a play about her own personal experience with homelessness. 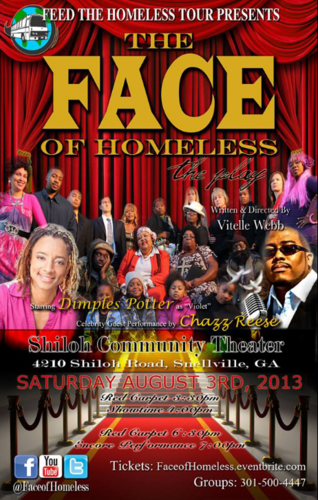 The Face of Homeless will be onstage in Atlanta this coming August 3, 2013. Vitelle is also the founder of the Feed the Homeless Tour. Recently, I had the opportunity to speak with Vitelle. 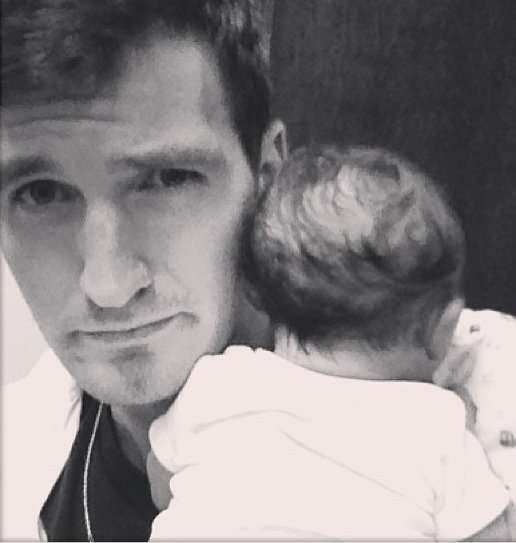 Here’s what she told me…. The Face of Homeless is my life and experience, portrayed on stage. It is also the stories of a few other lives as well as real life situations that have been experienced by many. The show exposes various circumstances involving homelessness. My hope is the stories of our characters, Gary, Violet, Shelia, Mark and the others will help people to understand that homelessness can happen to anyone. Too many people have a stereotype of what they think homelessness is; a preconceived idea of who the homeless are. People think of the homeless as being an old man digging through a trash can and asking for change to get a beer. Our hope is this stage production will reveal the truth about who the homeless are. With our show, we hope to encourage people who are going through or have gone through similar situations as well as bring awareness to the community of what homelessness really consists of and that it exists in our own backyards. The Feed the Homeless Tour is a non-profit organization I founded seven years ago to help meet the basic needs of the homless from state to state. We provide such things as food, clothing and hygiene items. We assist people with finding jobs and housing and connect them with other organizations that may be able to help them based on specific needs. We never turn down someone in need due to a lack of identification or age and gender. We strive to end homelessness and have done so for many people! Our stage production, The Face of Homeless, is one of many fundraising efforts to support Feed the Homeless Tour goals. It is our first stage production and we anticipate many more. After our Atlanta area premier on August 3, 2013 we will travel the country bringing this production to all fifty states, helping the homeless of each state we visit. I want to thank you for what you’re doing to help others. God gave you a big heart and a willingness to sacrifice your time for your brothers and sisters. You are living proof that we can take our life experiences, both positive and negative, and use it to benefit others. I wish you much joy and success as you continue your journey. Thank you so much for this! Beautifully written! I appreciate your support! You are very welcome! It was my pleasure. I’m looking forward to the show!